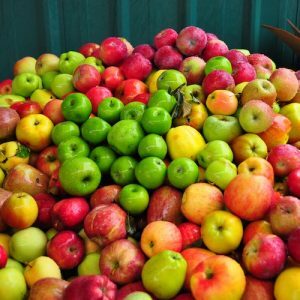 It’s apple season in Oregon and the fruit is ripe for the picking—so many varieties, so much bounty! There is a range of flavor, size, color and crispness to choose from. Jeff and I spent Wednesday, October 4, interacting with medical students at OHSU, and, as with the season’s apples, appreciated the rich variety of ideas that came through their questions and reflections. We were looking forward to speaking with students and all of them were receptive to Talia’s story. It was apparent that Talia’s voice moved them. We found that medical students in their 2nd year of study, in particular—just as they are about to begin their clinical rotations—asked questions and expressed ideas that led to discussions of possible actions that we, as an organization, might take. That is, we were really interested in presenting Talia’s story to medical students because it is an important learning tool for them; but they listened to the story, reflected on it, and had some good ideas that we at Talia’s Voice may want to explore in greater depth. One of the students at OHSU is involved with the Institute for Healthcare Improvement, a global healthcare organization that works to redesign health care through system changes in the areas of patient safety, quality improvement and person centered care. IHI has Open School Chapters, and one of 2nd year students is a leader in that. She’s involved in preparing “the next generation of health professionals to be change agents.” We’re already in conversation about coordinating an event later in the year to help spread Talia’s story and the work of Talia’s Voice. One student asked a question in the Q&A about how to be a voice when they are still “Learners” and really powerless. That is, this person was interested in tips for standing up when they believe a healthcare professionals might be practicing in ways that are unsafe or unethical. This led to an interesting discussion. In an emergency, there’s not time to figure that out—you just have to be vocal if you see something that you believe is not right. But are there ways to help empower medical students? One idea is for students to join together to approach those in power as a small group, perhaps in twos and threes. It’s easy for the head of a department or an administrator to shut you down if you’re all alone and don’t hold the power, but much harder to do when you’re in good (brave) company. One nursing student mentioned being told she’s a trouble maker or speaks up too often. (What’s “too often?”) We need to explore how to help support medical and nursing school voices. A student, a parent and I spoke afterwards about what we might do to empower patients who are in a hospital, knowing things are not going right, but are made to feel small and like their view is wrong. How might we help patients have the courage to insist on being heard when they are being ignored? I joked that we need something like the ACLU has, where you can be a card carrying member. It’s not that this would solve the problem—doctors and nurses need to listen: that’s their job. But the truth is that they don’t always, and when you have no power in the system, you’re made to feel small and that you are wrong…even when you know inside you are right. Sometimes even when you do speak up, you can’t get them to listen (we are so sorry, Talia); but sometimes, patients would be heard if we could empower them to find their voices. Perhaps we could create some kind of wallet card for people, that reminds them that they are entitled to speak up on behalf of themselves or their loved ones. Knowing they are a card carrying member—that they have Talia’s Voice in their pocket—might give patients and patient advocates the confidence to use their voice, a way to say, “My voice matters and I am going to use it in spite of messages that suggest I should not.” Perhaps over time we could create an army of Talia’s Voice volunteers in various cities who patients/patient advocates could contact for support during a hospitalization. As I said, lots of interesting ideas to explore further. 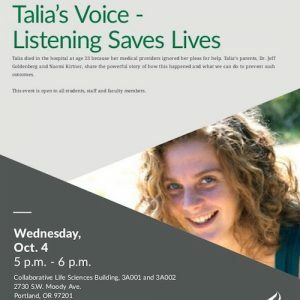 One possible place for Talia’s Voice to get involved is in admissions. What type of students are medical schools looking for? Who makes the best doctors? What criteria matter in finding the best people for this job? OHSU plans to use our presentation as an educational tool for future students. One thought that came out of our trip there is to figure out a way to create a DVD that organizations could purchase through Talia’s Voice in lieu of live presentations. It was really lovely to encounter so many engaged students, and their ideas were as varied as the apples in season right now! Sounds like a great session you had with the medical students this week. You taught and learned at the same time. Your work is just beginning and will likely evolve over time as you look to make a positive on patient care and service. Keep up this important journey. Out of this before words tragedy, you have found a way to keep Talia alive. In my mind, you are making her life and death, not only alive, but are educating so many others. Talia would be so proud of what you are doing. I read your writings with great appreciation to both you and with unending sadness about Talia. Turning tragedy into healthcare improvement; this feels so Talia-like. It seems like such a great way to make a difference in the way upcoming doctors will see their patients (and hopefully, hear them!) Amazing work!! Thank you. Talia’s Voice volunteers! A DVD presentation. Coordinating with IHI. Wonderful ideas!